Have anyone seen this page before? Is this available in the fans translated version? This entry was posted in K-On!, Manga. Bookmark the permalink. Hm, wasn’t this part in the anime? I remember Ritsu having photos of Mio to embarrass her or something similar to that. 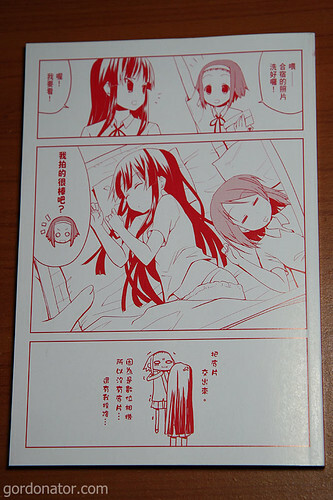 Except that in the anime, it only showed Mio hugging her pillow. i want to know does the fan translated version has this page as well? Well, the one listed at http://www.onemanga.com doesn’t have it. This is the inner front cover of the Manga Vol.1. Haha, so that was why you were inquiring about the Taiwanese K-On! manga that time, Gordon. I see, I see. It’s much better than reading 4koma all the time. well, all i know is K-ON! is great!